One of the biggest challenges facing synthetic chemists is how to make molecules of only a particular "handedness." Molecules can come in two shapes that mirror each other, just like our left and right hands. This characteristic, called chirality, can be found in biological molecules like sugars and proteins, which means that drug designers often want to develop medicines that are only left- or right-handed. It's a bit like designing the ideal handshake. Chemists have developed ways to separate the left- and right-handed forms, or enantiomers, of a molecule–such as molecular sieves that permit the passage of just one form. Another more sought-after technique is to create, from scratch, only the desired enantiomer and not its mirror-image form. 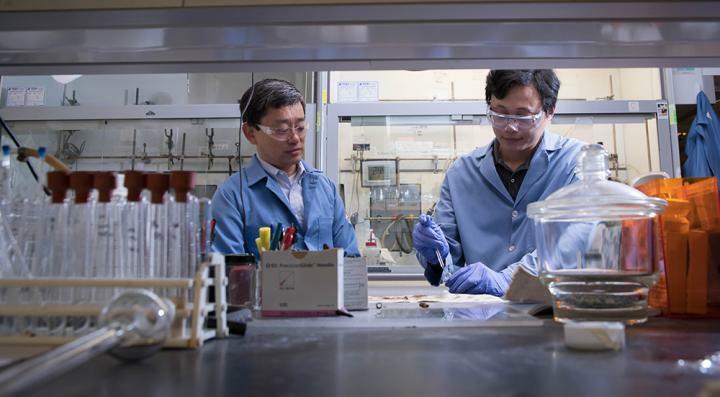 In a new study, published October 18 in Nature, Gregory Fu, Caltech's Norman Chandler Professor of Chemistry, and his team do just that, demonstrating a new method for making molecules with carbon-carbon bonds (virtually all pharmaceuticals contain carbon-carbon bonds) in only one of their handed forms, while using abundant, inexpensive materials. Molecules with different handedness can have surprisingly different traits. The artificial sweetener aspartame has two enantiomers–one tastes sweet while the other has no taste. The molecule carvone smells like spearmint in one form and like caraway in the other. Medicines too can have different effects depending on their handedness. Ibuprofen, also known by one of its brand names, Advil, contains both left- and right-handed forms, but only one version is therapeutic. In the future, Fu and his colleagues plan to further develop their method–in particular, they want to be able to control the handedness at two sites within a molecule rather than just one, providing drug designers with even more flexibility.